From Goodreads: The extraordinary journey that began in Miss Peregrine’s Home for Peculiar Children continues as Jacob Portman and his newfound friends journey to London the peculiar capital of the world. But in this war-torn city, hideous surprises lurk around every corner. 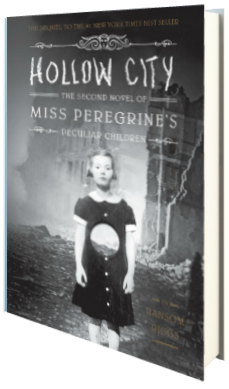 Like its predecessor, this second novel in the Peculiar Children series blends thrilling fantasy with never-before-published vintage photography to create a one-of-a-kind reacting experience. I was a little bit disappointed in Riggs’ latest novel, Hollow City. Not only did it take three years to write, much too long to keep my vigil going without a new gem to devour, but it also was a bit bland. While there are events happening, there wasn’t enough to really keep me preoccupied or glued to the pages, and I found myself repeatedly having to stop and look up characters to remember who they all were. As the novel picks up right where the first ended, this would be a great read for someone who hasn’t yet read the first book if they were planning to read them back to back. I really enjoyed Miss Peregrines…, but for me, this middle novel fell short. I am really hoping it doesn’t take another three years for Riggs with write book three, because Hollow City ends on a cliffhanger, just like it’s predecessor, and I would like to know what happens next, but I think another huge long wait will sink the novel for me before it’s even out, which is a shame. I liked this second novel enough to finish it, but it just didn’t have the flare or novelty effect that the first one did, and I can’t figure out why. If you’re like me and a huge wait time for cliffhanger novels just isn’t in the cards, then I suggest picking up this entire series when it’s complete, because book one is great and definitely worth the read, and I’m hoping book three is just as good—perhaps Hollow City met with that dreaded middle book syndrome that happens sometimes. Three stars. I read Miss Peregrine’s straight through the week it came out and loved it. I’ve had Hollow City since a few weeks after it came out and still haven’t finished it for all the reasons you mentioned.